The Scottish highlands is the stereotypical image of Scotland you imagine, with rolling hills, mountains towering over large glittering lochs and lots of thick lush green woodland. This is the place where the Scottish kilt originated from, haggis is a local specialty and of course a mythical monster resides. These are our 9 best things to do in the Scottish highlands, which you need to add to your Scotland bucket list. SEARCH FOR NESSIE: the Loch Ness Monster! 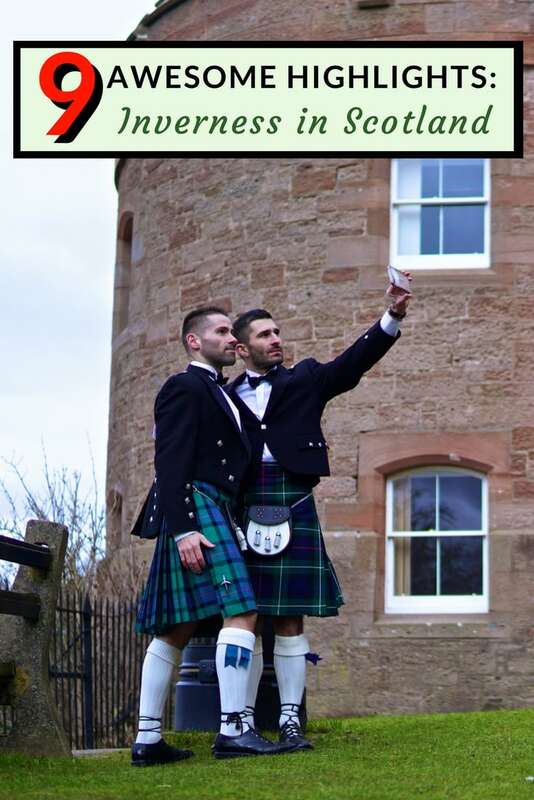 Today kilts are the official national dress of Scotland, worn mainly at state functions, also at weddings, funerals, festivals, and of course by curious tourists… And for anyone wondering, yes, of course we wore them “traditionally” – it would simply be rude not to! This mythical aquatic long necked dragon-like creature, which supposedly inhabits the dark, gloomy deep waters of the Loch Ness, has caused a lot of excitement in the Scottish highlands. Nessie, the Loch Ness monster, is serious business here, with over 1,000 official sightings to date, spurring a huge debate and research amongst scientists as to whether or not she’s real. Mythical or not, it’s one of the savviest tourist attractions we’ve ever encountered, with over 1 million people visiting each year trying to spot this elusive creature…like us! The story of Nessie began in May 1933 when Mr Mackay was driving his wife home. Suddenly she cried out when she saw a crocodile-like creature slither across the road in front of them, and disappear into the Loch. Back at their inn, she raised the alarm and she told the guests at her inn what she saw. One of her guests was telling Mrs Mackay's story in a local, which was overheard by the editor of the the Inverness Courier. The newspaper editor published the story, which went global. Sightings since 1933 have increased, especially in the 1950s and 1960s. You can learn more about the different Loch Ness Monster theories at the Loch Ness Centre & Exhibition museum, and reach your own conclusion as to whether or not Nessie is indeed real, or simply a savvy myth to drive tourism to the area. A cruise along the Loch Ness is the most popular way to try to spot Nessie, or at least get a feel for the large lake she calls home. Quick facts – a “loch” is the Scottish word for a “lake”, and the Loch Ness is one of the largest lakes in the UK, reaching a depth of 228m (750ft). We went on a guided cruise along the Loch Ness with Lochness by Jacobite, one of the most highly rated companies according to Tripadvisor. We loved it because the guides don't take themselves too seriously, giving a fun detailed history of the area, along with a full explanation of the Loch Ness monster myth. The Loch Ness has pretty impressive scenery. Our favourite is the gorgeous haunted Urquhart Castle, which is clouded with its own mysteries. For example, according to legend, there are 2 secret chambers beneath the castle, one containing gold, the other the plague. No one has ever dared search for the treasure for fear they may uncover the wrong chamber. The Scottish highlands is synonymous with epic landscapes, the sort you can imagine Gandalf and Frodo trailing through. The country is so famous for its landscapes that it was voted as the world's best cinematic destination in an online poll for USA Today. We wanted to really immerse ourselves within this glorious setting, so we stayed at the luxurious Eagle Brae, located right in the heart of the Scottish Highlands, 35km/22m from Inverness. It's in the middle of nowhere, around an old Highland broch on an elevated ridge overlooking Strathglass. You're surrounded by nature, with curious deer greeting you in the morning. We love the rustic feel of Eagle Brae. Inside however, the cabins are absolutely delicious, with full kitchen, hand carved wooden panels giving it a cozy feel, and our favourite, a fireplace. There's nothing more romantic than snuggling up together in a log cabin by the fireplace, right in the middle of the Scottish highlands. Above all else, this is a very gay friendly hotel to stay near Inverness. A “glen” is a Scottish word for a deep valley in the highlands. Glen Affric is a glen south-west from Cannich village, around 24km/15m west of Loch Ness. It is named after the River Affric, which runs through it. The glen has over 30 miles of ancient pinewoods, which we loved trekking through. Glen Affric is a definite highlight of the Scottish Highlands and one of our favourite things to do in Inverness. It's often named as one of the most beautiful glens in Scotland, which is why it is often used as the location for many films, like the Judi Dench Victoria & Abdul and also Valhalla Rising. There's also plenty of wildlife to look out for in Glen Affric, especially woodland birds, ospreys, otters, red deer stags and red/black-throated divers. Fort Augustus is a small but bustling picturesque hamlet worth checking out. It's located at the southwestern end of Loch Ness, and famous for its canal. Boats cross here at the Caledonian Canal, which cuts through the centre of the village. It reminded us a lot of the famous Panama Canal. We love coming here to sit outside one of the cafes or restaurants watching the boats passing through the series of locks on the canal. The Gaelic culture is most prominent here in the Scottish highlands. Traditional Scottish gaelic folk music involves bagpipes, as well as a band with a fiddle, accordion and sometimes a clàrsach (Scottish harp). It reminded us a lot of some of the folk music at the Rainforest Wold Music Festival in Kuching, Malaysia. There are some bars in central Inverness where you can watch live music. The most famous is Hootanannys, which has traditional live music every evening. Another bar worth checking out is Johnny Foxes, which has a mix of both modern and traditional live events. Haggis is the local specialty in Scotland and the country's national dish. It is a savoury pudding containing sheep's heart, liver and lungs, which is minced with onions, oatmeal and spices. It's certainly an acquired taste if you're not used to it. Most restaurants here will serve up this local delicacy. We tried it at the Loch Ness Inn on our way back from our afternoon of Nessie spotting. Whilst it has an interesting nutty flavour, we struggled with it largely because of the thought of what it contains. But don't let that put you off trying it. Haggis is served throughout the year, especially during Burns Night, a famous Scottish festival on or around 25th January to commemorate the life of the poet Robert Burns. Traditionally a Burns supper starts with the grand entrance of the haggis on a platter to the sound of a piper playing bagpipes. When the haggis is on the table, the host reads one of Robert Burns' most famous poems called, “the Address to a Haggis”. Then, the haggis is ceremonially sliced into two pieces and the meal begins! We love the Scottish accent. The more North into Scotland you go, the thicker it becomes. Up here in the coastal Highlands and Western Isles, they speak Scottish Gaelic, which is a separate language out of Middle Irish – it is pronounced GAH-lick in Scotland rather than the common GAY-lick pronunciation of its Irish linguistic cousin. “You’re a long time deid” = “you're a long time dead”, ie lighten up because you have plenty of time to be a misery after you die. blether – means to chat away – talking, speaking or gossiping. For more, check out this detailed guide to Inverness as well as this 7 days Scotland itinerary. I’d be Nessie hunting guys! I love those specials on crypto creatures; Nessie sits near the top of my list. The region feels so mysterious to begin with. I can see a huge dinosaur chilling in those waters undetected – largely – over the past few centuries. Sounds like a fun time and hey, I’d give haggis a shot….why not?